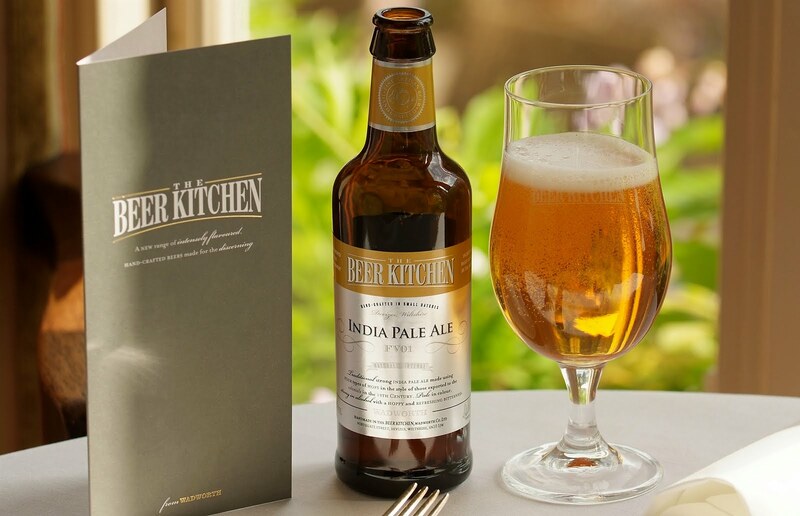 Wadworth brewery last year launched their Beer Kitchen range: five intensely flavoured bottled-beers, hand-crafted in small batches, specifically created to compliment food. Wadworth have also opened a Cookery School, located behind the Visitor Centre at the brewery in Devizes, Wiltshire. 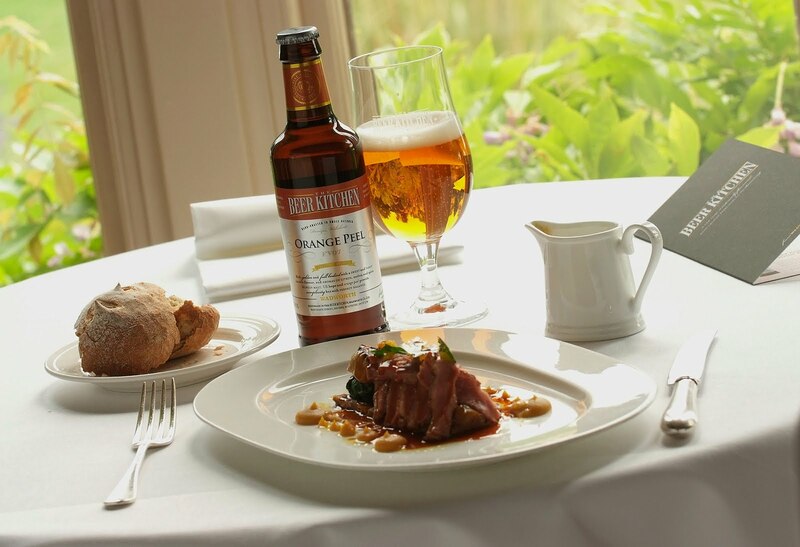 The school serves as a kitchen of excellence to educate and develop the skills of chefs from Wadworth pubs and as a place for members of the public to take part in fun, informative cookery classes. Having received an email from Teresa Dadey of Wadworth, kindly asking if I would care to try some samples from the Beer Kitchen range, I replied that I would be delighted to do so and would be happy to promote the products on my Blog, so here we go. But first I must insert a caveat. 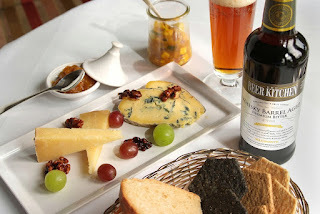 You won’t find me using phrases here such as “the wheat beer’s wild but enthused embracing of a goat’s cheese canapé”. 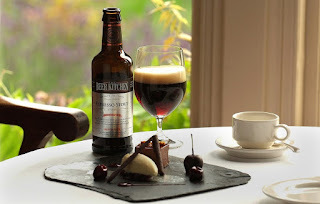 I have no objections to promoting beer as an accompaniment to food in a review but I’m no sommelier and make no pretence to be. The images supplied by Wadworth are therefore not of the food I actually ate. Now I’ve made that clear, let’s press on. 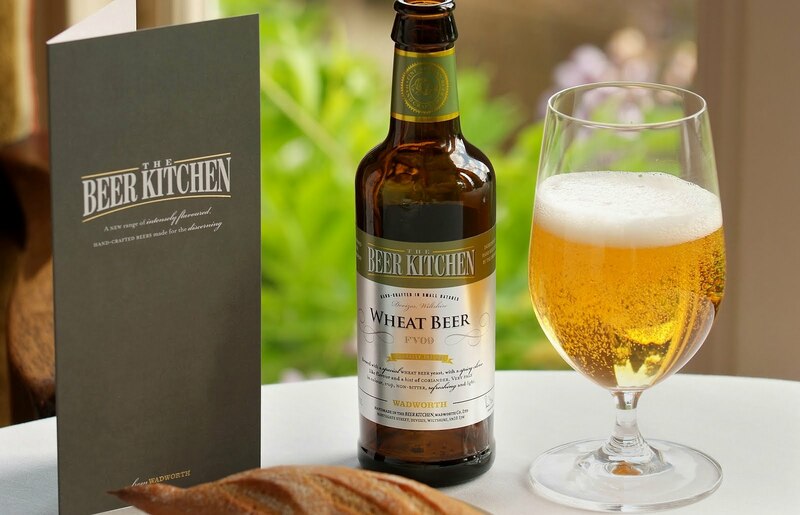 First up is the Wheat Beer, made with Saaz and Styrian Golding hops, Pilsner Lager Malt, Malted Wheat and Coriander. “A joy with delicate white fish or a light salad”, it states on the back of the label. I have it with tinned sardines and slid in tomato sauce for my essential Omega 3 and 6 fatty acids, vine ripened tomatoes, reduced fat creamy coleslaw and wholemeal bread with low fat spread. The only problem is that I’m hot and dehydrated from jogging, the beers come in 330ml bottles and by the time I’ve quenched my thirst, even at 5.0% ABV, there’s only half of the liquid left to accompany the food. 330ml as a food compliment suggests contemplative sipping but I’m not called The Quaffer for nothing. The tasting notes on the bottle state the Wheat Beer to be light and refreshing with a hint of spicy clove and tongue tingling citrus fizz. I’d wholly agree with that, adding banana on the nose. Light and refreshing it definitely was. The traditional IPA is described as “pale golden in colour, high in alcohol (6.2%) and brewed with four hop varieties”. “A robust accompaniment to spicy or barbequed food” it states, so I line it up alongside my regular Saturday-night post-pub treat: Chicken Madras (specially made extra-hot) curry from my favourite takeaway just down the road. The tangerine notes and spicy hop bitterness of the beer proved to be an excellent match for the powerful but subtle flavours of the Madras, while the lingering dry bitter finish of the IPA cut through the hotness of the curry in a sharp and most satisfying way. A pity, though, that I don’t have a few more bottles to hand, for I finish the beer long before the last grain of mushroom rice is forked up from the plate. The Whisky Barrel Aged Premium Bitter is made from traditional Fuggles and Goldings hops, pale and crystal malts, and is aged is aged for two months in whisky barrels to develop its distinctive, smooth, bitter warmth from the spirit. “A heavenly companion to any cheese board”, it says on the label. That presents me with a bit of a problem as I make a point of avoiding dairy foods that are high in saturated fats. Fortunately, my local supermarket stocks an independent brand of strong cheddar with less than 2.0% saturated fat content. I place thick slices of this cheddar atop Scandinavian-style high-fibre crispbreads, separated by a thin layer of low-fat spread and I’m now ready to remove the bottle top. Smoked vanilla wooden notes and whisky aromas emerge and the taste is as rich, dark and nutty as the label description claims it to be. But I would definitely add toffee and caramel to that. And at 5.8% this does prove to be a very pleasing companion to the healthy cheese and crackers snack on my plate. Made with Fuggles hops, pale, chocolate and crystal malts, Kenyan Nyeri coffee beans and muscavado sugar, the Espresso Stout at 5.5% is said to be “perfection with a chocolate or toffee dessert, or enjoy as you would a coffee”. I don’t eat chocolates or desserts, so I take the latter advice. For me, the “smooth sweet finish” rather overpowers the “sumptuous bitter coffee flavour”. Perhaps that is because I am used to more aggressively bitter Espresso Stouts and richer roasted, full-bodied coffees. But I can see exactly why this stout could be sipped in blissful contemplation while nibbling on squares of chocolate. I didn’t receive a sample of the fifth beer in the range, Orange Peel Beer, so I’ll simply state the product description: “rich, golden and full bodied with tangy orange and caramel sweet flavours, and aromas of citrus, melon and spice - a superb complement to rich dishes such as game, or to savour on its own”. I’d be very happy to recommend these beers to the section of the market at whom the product is presumably aimed. In sociological terms I see this section as an emergent middle-class set of consumers where status distinctions based on cultural capital are obtained in this culinary context from matching small-batch beers with what might be termed (without any intended pejorative connotations on my part) gourmet or gastro food. But would I purchase these beers for myself? I’d certainly like to try the IPA and the Whisky Barrel Bitter once again and if the range was locally obtainable in an off-licence or supermarket, I’ll probably be tempted to sample all five; but as far as I can ascertain, Wadworth is the only direct supplier. And if I was to buy any of these on a regular basis, I’d want them in 500ml bottles to go with my large, honest portions of plain (and healthy) fare. As I said, I’m no sommelier - but these are good beers. An interesting concept and what looks like an excellent range of beers. I'm with you though on prefering 500ml to 330ml bottles. The question is, where can I get hold of these beers? Wadworth don't operate in Kent, and I can't see them being sold in our local supermarket. As far as I know, Paul, you have to order them from Wadworth.